This guide was generated by crown-sourcing information from rescue victims and rescue professionals (Air National Guard Pararescue Jumpers, PJs). Feedback fell naturally into the categories below. Everyone has a personal responsibility to maintain self-sufficiency in the wilderness and should always base decisions on getting back on their own. Your best resource is the ability to think in a controlled manner when a life-threatening crisis is happening. Prevention, not treatment, is what ultimately will save your life in the wilderness. There is a notable difference between a gamble and a calculated risk. A calculated risk considers all the odds, justifies the risk, and then makes an intelligent decision based on conservative judgment. A gamble is something over which you have no control and the outcome is just a roll of the dice. You cannot make intelligent decisions in the wilderness if you do not understand the risks. Never give up; the will to live is a valuable asset. Sometimes people perish simply because they fall short on perseverance. As a rule, if you die in the wilderness you made a mistake; careless judgment has a sharp learning curve. Wilderness rescues in Alaska are often dangerous to the rescuers and always weather-contingent. People do not realize the devastating impact that their accidents have on friends and loved ones. The prerequisite to misadventure is the belief that you are invincible or that the wilderness cares about you. Daryl Miller shared a “60% left in the tank” guideline for guides and rescue professionals. The idea is to make sure you have 60% left in reserve in anticipation of needing to perform a high-exertion rescue. I like applying this to my exertion level on personal trips. If I’m constantly running at 90% exposure, a light accident, broken-binding or paddle, could be disastrous. In kayaking terms, this is “save some for the swim,” meaning, don’t get to 100% exhaustion trying to roll out of a hole, leaving you with no reserves for whatever comes next. Route map with alternatives, cruxes, go/no-go obstacles, bail outs. Expected timeline and actions to take. For example, when is a lack of communication expected, alarming, an emergency? When should the in-town contact charter a flight to get eyes in the sky? Equipment description, type/amount/color of: tent/shelter, sleeping system, clothing, boat, food, fuel, meds, etc. Can they coordinate a rescue? See Remote Overland Travel: Satellite Communication for details on PLBs, SPOT, inReach, and Satellite phones. 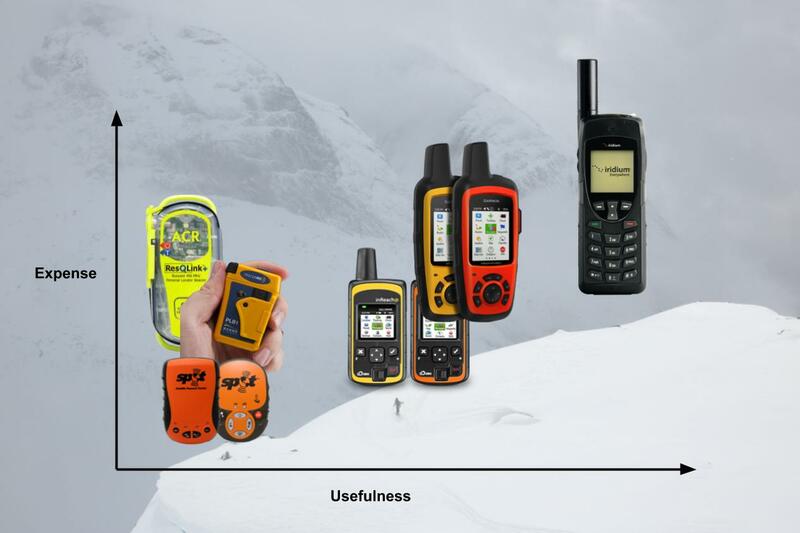 In a nutshell, on remote trips we carry multiple inReach SE devices, and/or a satellite phone if we can find one to borrow. Dry bag. One rescue victim thought that simply having clothes in a dry bag might have made a self-rescue possible. Review the trip plan. A good trip plan should have a few thresholds for time/no comm (“a little strange”, “worrying”, “get eyes in the sky”, “call 911”). Always maintain accurate account information associated with your device and service. Understand how your primary emergency contact factors into a successful rescue and provide them with as much information as possible about your trip, its members and any other critical details. Before you venture into an area, research the first response assets allocated to that area. Know who will come if needed and how long it will take them to reach you. For accidents in the National Park, NPS tries to utilize NPS assets first. If not sufficient, they can contract the PJs. With mountaineering, a myriad of factors, compound to create a risk mosaic which requires varying degrees of awareness and care. These factors include but are not limited to the varying terrain, stages in rope management, objective hazards, and weather. The old adage of “the leader must not fall” holds true most of the time. A timely rescue is the exception rather than the rule, plan on self-reliance.